The opening round of the 2019 Six Nations championship produced a result that should be of particular interest to the rest of the rugby world. Particularly if you, like most of us, had been caught up in the hype created around Ireland over the past year or so. Ireland were magnificent in 2018. They won the Six Nations title, beat the Aussies in a three-match Test series Down Under, and finally stopped the All Blacks in Ireland. Joe Schmidt has built a team capable of challenging the best. Dominant forwards, a tactically-astute halfback pairing and finishers with killer instinct. But what Eddie Jones’ England showed with a 32-20 victory in Dublin last week is that if you’re capable of smashing the living daylights out of a team, the form book means nothing. Irish fans complained afterwards how they couldn’t understand the consensus that their forwards got smashed, seeing as they won all their scrums and more lineouts than their English counterparts. Even their tackle success rate (90%) was better than England’s (87%). The telling stat? Dominant tackles. England made 48 dominant tackles compared to only eight dominant hits by Ireland. That means that 27% of their tackles were dominant compared to Ireland (6%). Why is this stat important? The other big upset in recent memory, where the underdogs upset the apple cart by humbling a so-called “unbeatable” team at home, was the Springboks’ defensive heroics last year against the All Blacks in Wellington. On that day Rassie Erasmus’ Boks made 39 dominant hits compared to the All Blacks’ four. It was a performance that saw the Boks absolutely smash anything that came in their way, with three Boks making more than 20 tackles. One of those Boks was Pieter-Steph du Toit, named the 2018 SA Rugby Player of the Year this week. Guess how many Englishmen had to make more than 20 tackles this past weekend? Yep, three of them. Even more encouraging is that England, with a new defence coach in former Bulls’ man John Mitchell, employed a similar rush-defence pattern as used by the Boks last year. One English rugby scribed even made the point on social media this week that Ben Youngs, England’s scrumhalf, had copied Faf de Klerk’s role on defence. It takes at least three players willing to tackle their bodies (and those of opposing ball-carriers) into the ground to beat the big boys. In Du Toit, Franco Mostert and Steven Kitshoff, the Boks have three players whose work rate on defence is among the best in the world. Add players like Malcolm Marx, Duane Vermeulen and Siya Kolisi who frequently topped the “Dominant Tackle” charts last year, and the Boks don’t give an inch in the contact area. What South Africa lacks is a halfback pairing that is capable of tactically controlling the game. 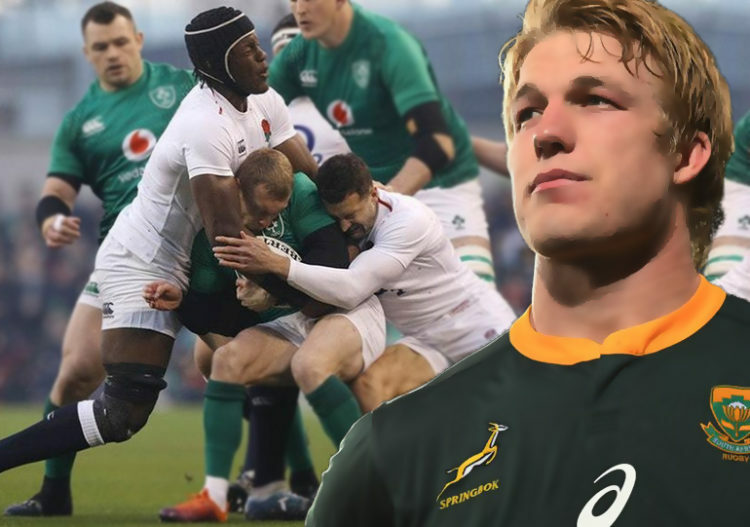 For all De Klerk and Handre Pollard’s game-breaking abilities, I still haven’t seen them manage a Test like Conor Murray and Johnny Sexton, and Youngs and Owen Farrell did for Ireland and England this past weekend. Seems back to the old cliche’ that solid defense wins test matches, rather than the twinkle toes stuff! WaIt for it……….,—–the domkrag man is choking on his weaties before he launches into a 200 line diatribe. Your wish is my command O Sweetass. Cheers. Nah Sweet I think the Hermanator is in hiding! Yeah,I think the school holidays are over. Dear Sweetaz and Barry. Hi Guys, I thought I’d give you palookas a bit of a break break before the season really begins because last year was again for most of you an unmitigated disaster and I didn’t want to rub it in. The Boks failed ( as predicted ) the Lions were SA’s best by a country mile and dom krag rugby was again exposed as being one dimensional tripe as the lack of trophies again confirmed. Last year the Stormers and the Bulls were embarrassing to say the least with the Sharks only marginally better but again we hear from our rugby pundits how this year will be different. Really ? Fleck still there, Du Preez still there and Pote with a mountain to climb. Imaginative smart coaching will again be in short supply. The Lions will be harder pressed to deliver but as they say cream always rises to the top. Which brings me to Dawie’s article.Like most devotees he places stampkar/dom krag as the go to option for success. He falls into the trap of making the exception the rule ie the two games mentioned and tries to convince us that defence wins matches. Well sad to say the very opposite applies. And here’s why. On to Newlands and despite dominating most facets the Boks still managed to blow it AGAIN. What it meant is having the ball is great but when you have players lacking skills and smarts it wont work for you. Another loss and once more proving the exception does not make it the rule. The creativity and skills of the players and smart coaching (NZ) will over a number of games always trump the domkraggers (Boks), history has deemed it so. Solution ? Get more creative, skilled players and a smart coach and the Boks will once more rise from the Ashes. The other exception mentioned by Dawie is exactly as above. Ireland have all the trophies and convincingly beat the AB’s playing proper rugby. England has none. A one off win gets the domkraggers all excited because it appeals to their limited no frills vision of what rugby should be but as has been proven by NZ and the Lions skill and smarts will always trump dom krag. I rest my case. Cheers. Oh, your back, how nice and thanks for keeping it brief! So to summarize four of your paragraphs into one, we’re talking “Complete Rugby” – a good balance between the hard grind and attacking flair, if so, we’re in agreement! 2018 was pretty good for the Currie Cup champions thank you very much and as I recall we smashed the Lions in all three of our last outings – ouch! Then there was that humiliating pummeling at the hands of WP during the Currie Cup, that really must have left scars! Funny enough, we’re also in agreement on the Springboks. Their attacking game started well but seriously deteriorated. One can only hope that they will find a more competent Attack Coach for the 2019 season! Thanks for that Barry but I was talking about real rugby. The CC is a pale imitation of it’s former self and only meaningful to the sides that are hopelessly incompetent in SR. If truth be told beating the Lions in SR with a last gasp intercept try for the first time since 2014 is more of an indictment on how poor the Sharks have been in relation to my boys these past five years, lol. Clutching at straws my friend but I do recall a Festival Sunday match played recently where the Lions roared once more over the old Sharkettes. But anyway it’s all systems go next week so good luck to your team because the Lions need a strong challenge from our Conference brothers in order to soften up the other SR teams overseas.. Cheers..
Good luck to your team too, honestly you’ll need it. Marx can’t do everything, poor chap! Festive weekend – you mean the one where young Bosch bossed Jantjies? Best and most skillfull flyhalf on Festival Sunday undoubtedly Elton Jantjies. Cheers. I’ll concede one thing Hermie EJ has won NZ’s players player consistently over the years! They love him down under. Ever noticed how Hansen and Barrett rave about him before every test? Elton unquestionably smashed records during SR 2018, so there in no argument really. He came first in two categories, which lets give it to him, takes some hard work and dedication. He came first in “missed conversions” – 19 of them and also a first in “missed tackles” 45 of them. How is it that he was again included in the Lions side, let alone the Springboks!! 44 were probably forwards that first ran over your favourite flyhalves and centres and the 45 were desperate tackles. I think it shows the man’s commitment. Thanks for pointing it out. He played a pivotal role in the Lions success these past five years taking them to THREE SR finals. Name me one flyhalf in all of SR who has managed that ? Look at the try count and the craftsman behind it, right up there with the best of the NZ teams. Your missed conversions punt is also off the mark. In 2018 the Lions scored 88 tries. The Stormers scored 46. Guess who would miss more ? He also played in 18 games in 2018, that’s one missed conversion per game. Wow that’s unforgivable. I have commented on his missed tackle stat on the Kwagga CHOC article. Again these stats are highly subjective and only useful to coaches who analyse each tackle objectively. In closing let me add this. If the Boks played expansive rugby with a team of skillful smart players only one man would qualify for the flyhalf berth, that’s right EJ. If you prefer the no frills crap then pick old Polly any day. The only problem is we’ll have yet another failed year to endure once more. None so blind ……. Cheers. Slow down Herman, take a deep breath and try and understand this. No Jantjies didn’t take anyone anywhere. Lions got through to play-offs despite having a fly half who missed more tackles than any other player in the competition – plain embarrassing! Uhm, missed tackles are missed tackles and Lions have two of the biggest offenders in the heavy traffic area. Probably why they have no Silver ware! Lastly, it’s complete rugby not expansive rugby, remember we discussed this earlier! Barry then tell me this. How come our other three Franchises who mostly rely on defence but are generally poor on attack are so embarrassing in SR ? Why haven’t any of them reached a Final in donkey’s years ? Sharks impress in one or two games last year only to get thumped in their ‘lucky’ QF qualifier. Lions beat the Argentinian first team and the bulk of the Wallabies in the Waratahs team in their playoff games scoring NINE tries in the process. It’s also common knowledge you don’t win finals in NZ due to bias, weather and travel fatigue but hey still made a fist of it. As I’ve said before SA’s No 1 team by a country mile. I think you need to read my original post again. I mentioned the tackling aspect as well as the ‘complete rugby’ question. Defence is a basic of the game but it’s what skillful smart teams do with the ball that wins trophies. Across the world the team that scores the most tries usually wins the big competitions. No team can rely on defence and a team of unskillful not so smart domkraggers and expect to win anything. Just ask the Bok’s who’ve been trying since 2009 to come to terms with ‘real’ rugby and failed miserably. That’s a decade in the doldrums old chap a sad indictment on our inability to adapt. Expansive rugby and complete rugby is the same thing in my eyes anyway and remember the article was trying to sell us the staple dom krag argument of defence being the answer to all our woes. Expansive rugby assumes that the defence is in place and rely on the game breakers to do the rest. Regrettably the other Franchises still haven’t twigged but then again look who’s coaching them. I trust you saw the Ireland / Scotland game on Saturday and how the teams ran at each other for 80 minutes. Intelligent basic defence, judicious kicking and attacking with ball in hand all on display for the unbelievers. I hope Rassie took notes. I note your coach Du Preez said he wants to score four tries a game, lol. Has he finally realized that tries win competitions or does he still believe that four tries gets you a bonus point in SR. If that’s the case then he’s even more out of touch than even I believed. Wow. Let the game begin. Cheers. LOL, – Schrodinger I’m actually embarrassed for you, to so obviously display your ignorance and lack of comprehension on a public forum simply denotes an incredible lack of self-awareness. The sad thing is you lack the mental acuity to grasp just how pathetic your continued persistence with the fallacies you spout makes you sound. Lets recap,–the Lions have STILL won nothing. My prediction is the Lions will once again this year STILL win nothing because, in the final analysis, they don’t have the nous to play complete rugby, afkop hoender is their style..
You still don’t understand the basics of rugby. Its COMPLETE rugby, not expansive rugby that wins and DOMINANT defence is a huge part of that. But apparently, you don’t understand that either. SweetAz I see you are still following my posts with the intensity of a fanatic on speed. Trying to belittle me is useless old chap it simply won’t work. Is that your only option when on a ‘public forum’ ? Trust me the posters out there can see right through your personal attacks on my character and your lack of objectivity is obvious to all. I woobviously can’t deny you the right to criticize my posts but just remember these forums are discussion / opinion based and should be done on a non personal level. You in fact lower the tone of these sites old chap and may I suggest you do a spell of introspection to help you gain some perspective. In the meantime I have responded to Barry above which kindly read and respond to if you so wish. Cheers. Aahhh,–so that’s how it works. Only Herman is allowed to “belittle” and get “personal”. I’ve known people like you all my life old chap, happy to dish it out but then runs home crying to mommy when the return fire eventuates. Your insistence that you and only you are always right and the only person on this forum that knows anything precludes any option for “debate” or “discussion”, your “opinion”, which you repeat ad infinitum in lengthy screeds whilst cherry picking stats that suit you has become so predictable that its passed through all the phases from interesting to boring and is now merely irritating. Trust ME old chap, most of the posters on here really really wish you would get a new tune or simply just go away. You are like that ONE guy we all had during National Service, the ONLY one that was always in step. I’m not belittling you, your perception is driven by your own inbuilt inferiority complex. Like we say,-you look behind the door you hide behind. I took a brief glance at your screed and got bored, it appears to be the same crap you have been peddling on forums for the past decade. Nothing new, insightful or useful.